It’s been an interesting few days. I did something to my back lasy Thursday and by Monday it was screaming. I’ve never experienced such back pain. It was impossible to sit down with out yelping. This coincided with what ended up being a 6 hour trip home from Vancouver Island. The busiest day of the year for the ferries resulted in a 2 hour wait for foot passengers. So basically, I stood for 6 hours. Meanwhile, Howard calls to ket me know he has injured his shoulder. We have a performance this Friday at Friday Night Live and he can’t play. I don’t even know if I can at that point. I’m not yet even able to comfortably sit down. Luckily, things rapidly started improving by Tuesday afternoon and I am now able to sit at the piano comfortably and perform. So the show goes on. I will now be doing a solo event at Friday Night Live. This is a beautiful intimate space with a beautiful Steinway grand piano. We’ll be doing this in the round, which I love. I have a couple of comp tickets available. First come, first serve. Let me know. 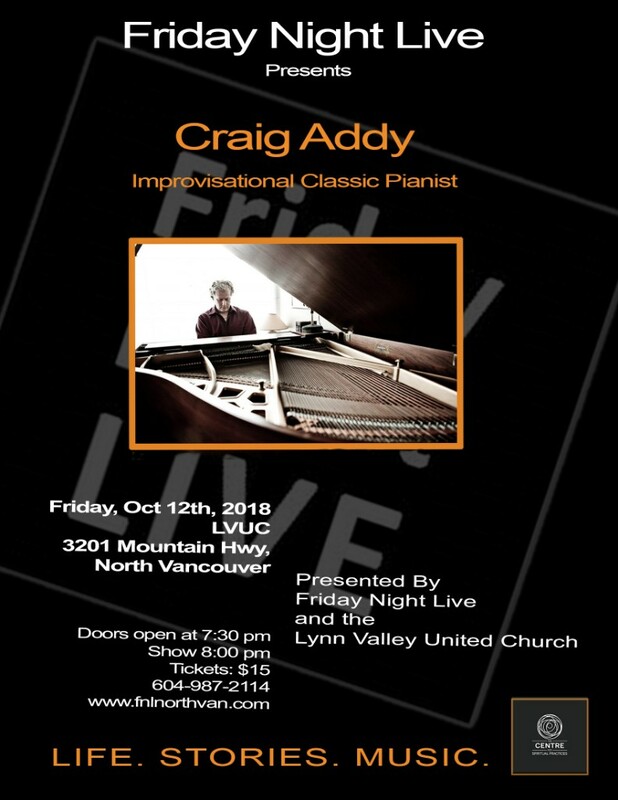 Craig Addy returns to Friday Night Live on October 12, 2018 to provide the magic of his improvised piano music. Vancouver pianist and composer Craig Addy has been improvising at the piano since he was a child. Craig is the founder of Under The Piano – Sound Spa For Body, Mind, and Soul, a company that creates a unique musical experience. To give you an idea, imagine having a personal private concert for one or two people – while lying under the piano. All the music that is played is spontaneously created and improvised in the moment especially for “you”. Craig is also a member of the Amicus Music Duo (with clarinetist Howard Meadows) and the Quiet Hearts Ensemble (with clarinetist Howard Meadows, violinist & vocalist Mark De Silva, flautist & vocalist Anand David, and guest artists). Quiet Hearts Ensemble’s “Music Oasis” features spontaneously improvised music, usually in the glorious acoustics of venues such as Vancouver’s St Andrew’s-Wesley United Church. If you have been to one of Craig’s performance before, then I know you will not want to miss this. If you have never heard Craig play before, be sure to attend.